The EPA, city and state governments and foreign countries continue setting mandates and goals for emissions reduction. We believe that fuel cells are the key to substantial emissions reduction for the transportation industry, and we’re not alone. More than three-quarters of auto executives surveyed in 2018 believe that fuel cell electric mobility will be the real breakthrough for transportation (source). That puts Nuvera at the epicenter of the emerging zero-emissions engine industry. Fuel cells are the only zero-emissions technology that provide equivalent performance and operating characteristics to today’s diesel-driven equipment. As an electrified solution for heavy-duty vehicles such as Class 8 trucks, transit buses, and port equipment, fuel cells offer the convenience of quick refueling and the ability to travel long range. Our fuel cell system for forklift operations is one example of the ease and opportunity fuel cells provide for commercial and industrial operations. While forklift trucks have been around for decades, their batteries need to be changed and charged three or more times per day, cutting down productivity in high-intensity warehousing, distribution, and manufacturing operations. Replacing the battery with a Nuvera® fuel cell engine, these trucks can refuel quickly without the need for swapping out multiple batteries throughout the day. As with batteries, fuel cells are zero emissions – a vital requirement for indoor usage. This technology capability for forklifts scales readily to bigger engines for bigger equipment. Seaports, which are concentrated emissions sources, are an ideal opportunity for zero-emissions freight handling made possible by fuel cells. Southern California has the worst ozone and fifth worst particulate matter pollution in the United States. Drayage trucks – used to haul goods a short distance between seaports and warehouses or other locations – represent one percent of vehicle miles traveled but emit 12 percent of total NOx pollutants in the South Coast Air Basin (Cory Shumaker, 2018). The state has a goal of converting diesel powered terminal equipment to zero-emissions equipment by 2030 and replacing diesel-powered trucks with zero-emissions trucks by 2035. Our project with the California Air Resources Board will demonstrate a Hyster® fuel cell container handler at the Port of Los Angeles powered by a 90 kW Nuvera® fuel cell engine. Similar efforts are underway at ports worldwide. These initiatives frequently involve the use of renewably generated hydrogen – for example, using wind- or solar-powered electrolysis or steam reforming of biogas. Fuel cells are enabling a quiet but inevitable revolution in the transportation sector. Hydrogen fueling infrastructure is being deployed as we continue to develop fuel cell propulsion products in lock-step. California has taken the lead in the U.S. by building 35 hydrogen stations out of a planned 200, with a goal recently set for 1,000 stations in the state by 2030. This infrastructure will allow light-duty vehicles, over-the-road heavy duty trucks, transit buses and industrial equipment to be seamlessly powered by fuel cells. As part of the vanguard of this new wave of clean transportation technology advancement, we’re proud to be part of building an industry that will have profound impact for decades to come. 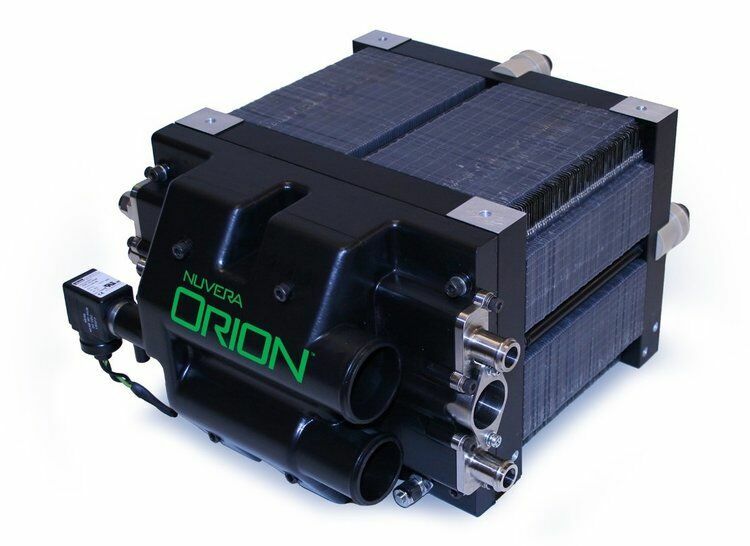 Nuvera’s distinctive technology platform, years of know-how and proven capabilities provide vehicle manufacturers the flexibility needed to power a full range of models. The possibilities for a zero-emissions transportation industry are limitless. Connect with us to come along for the ride.